It's been a while since my last post, I know. I've been keeping myself quite busy with my newly found obsession. 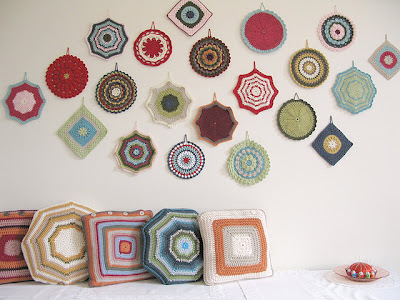 Now that I've learned to crochet in the round, I see many beautiful trivets and pot holders in my future. And I already know what I am going to do with all of that goodness: I am going to hang them on the wall like the amazing Emma Lamb did with her gorgeous pot holders (see photo above). I am every bit in love with the colourful and endless possibilities. I have almost completed Craftyminx's Crochet School and am now working on those wrist warmers she proposes as the fist pattern to try out. They are super easy and a pleasure to make. I have never owned wrist warmers before, so wearing them will be a new adventure in itself. Mine will be a happy orange colour! I am thinking they would look great over black leather gloves. Stay tuned for more craftiness coming up! P.S. - May I just mention I adore Christiane Engel's monthly desktop wallpaper? I am always excited to find a new goody each month. They soothe my sadness over yet another month ending. Go check them out!